Maruti Suzuki Ertiga MPV launch on April 11! Maruti Suzuki will launch the Ertiga 7-seater MPV on 11 April, 2012. 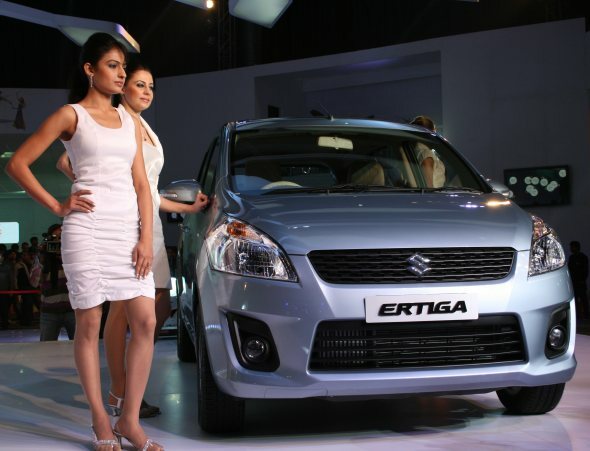 The prices of the Ertiga will be decided upon post Union Budget 2012. Maruti Suzuki unveiled the Ertiga MPV at the 11th Delhi Auto Expo. The Ertiga will kick start a new compact MPV segment in India. According to The Economic Times report, the company is planning to sell the Ertiga at around 5,000 units per month. The report adds that the utility vehicle (UV) segment in India accounts for roughly 14 % of the Indian automobile industry and out of this, the MPV segment occupies 66%. The Ertiga’s front looks like a buffed up Ritz, which is evident as the Ertiga is built on the Ritz platform. The side profile reveals the pull type door handles as in the Ritz and Swift while the rising shoulder line breaks the otherwise monotonous design. The rear of the Ertiga has Honda Jazz like taillamps and a bland boot door. The interiors may be colored in beige while the dashboard of the Ertiga has a Swift inspired design. The central console, AC vents, steering wheel, gear knob are all carried over from the Swift. This hints that with a higher level of part sharing, Maruti Suzuki will likely price the Ertiga competitively. The Ertiga measures 4265 mm in length and 1,685 mm in height. It houses seven adult seats (2+3+2 configuration) with 135 litres boot space when all seats are up. For additional boot space, you can fold the third row seats to get 480 litres. The Ertiga will be available in both petrol and diesel versions. The petrol variant will be powered by a 1.4-litre K-series motor that makes 98 bhp of power and 130 Nm of torque. The diesel variant will be powered by 1.3-litre DDiS super turbo that makes 90 bhp of power and 200 Nm of torque. The diesel engine will have ARAI-certified mileage of 20.77 kmpl. The Ertiga will likely come with features such as roof mounted AC with independent AC controls for the second row and rear wiper as standard across all variants. The top-end variants of the Ertiga will most likely come with driver and front passenger airbags, ABS with Brake Assist and EBD, steering wheel mounted audio controls, automatic climate control, driver seat height adjuster and rear defogger. The Ertiga is expected to be priced in the range of Rs. 6 – 8 lakh depending on the variant. The Ertiga will most likely come in three petrol variants, LXi, VXi and ZXi and three diesel variants, LDi, VDi and ZDi. The Ertiga will enjoy no competition until Chevrolet launches the production version of the MPV concept which the company showcased at the 2012 Delhi Auto Expo. With its compact dimensions, the Ertiga may not be an alternative to premium MPVs such as the Toyota Innova. The Ertiga may appeal to large family buyers who are looking for a reliable budget MPV. « Mitsubishi Pajero Sport to be launched on 13 March!